Ripped from the day's headlines, the adventures of three globetrotting reporters spring to life in this ultra-rare TV series, which aired for one season on ABC. In a unique conceit, the show has three rotating stars, meaning that the program is essentially three different series using the same title, united by the common thread of the "Trans-Globe Wire Service" (a fictionalized version of the Associated Press.) Taking their turns as newshounds are World War II movie hero Dane Clark, Hollywood veteran George Brent, and Academy Award winner Mercedes McCambridge. 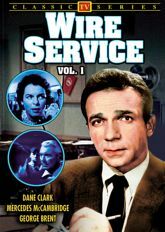 Wire Service was the first hour-long, weekly drama series with continuing characters to last a full season on television. HIDEOUT: An elusive femme fatale is implicated in the death of a famous athlete. THE JOHNNY WRATH STORY: The disappearance of a small boy becomes a media frenzy when his relationship to a convicted killer is revealed. THE NIGHT OF AUGUST 7th: When a riot breaks out at state prison, a desperate search begins for the only person who can negotiate with the ringleader.